I've had people ask me if I'm enjoying my new kitchen and I reply "I'm starting to". There are still times when I have flashbacks to last summer & just get angry. So I'm not there yet, but it's definitely getting there! It's time to tie up loose ends and just be completely done with it. I still have to have the walls & ceiling painted, but those people are out of my house. 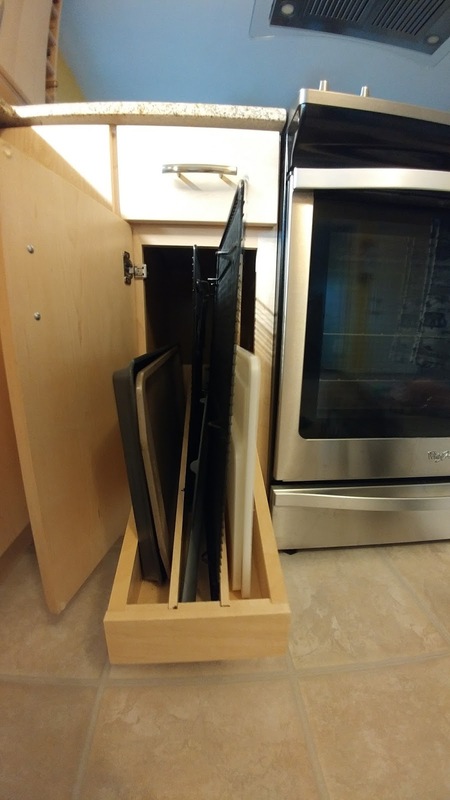 I wanted someplace to put my microwave so it wouldn't take up space on my countertop. 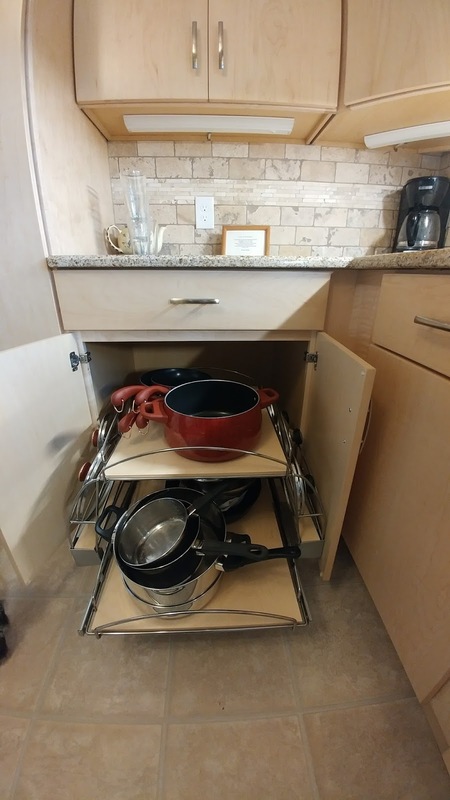 The shelf is reinforced to hold the weight. 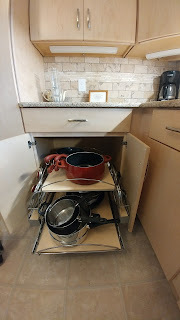 The 3 shelves where I store my small appliances (mixer, toaster, breadmaker, slow cooker, electric skillet) roll out. 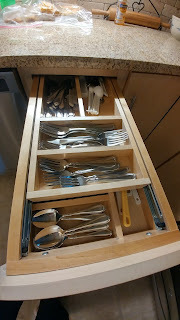 I bought some bamboo dividers to put in the drawer to separate my knives and other utensils. 2 shelves that slide out independently of each other. 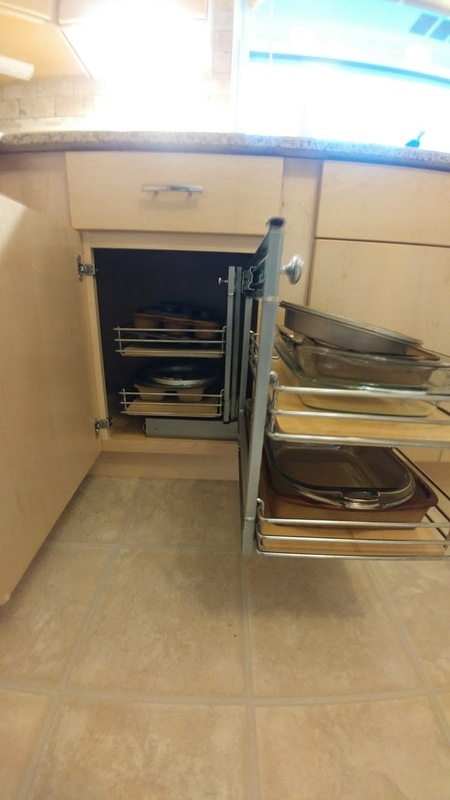 Racks on both sides hold the lids. 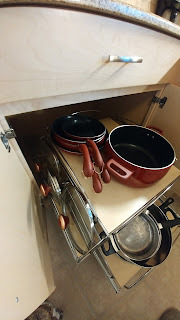 2 shelves pull out of the cabinet. Those 2 shelves slide over to reveal 2 more shelves. 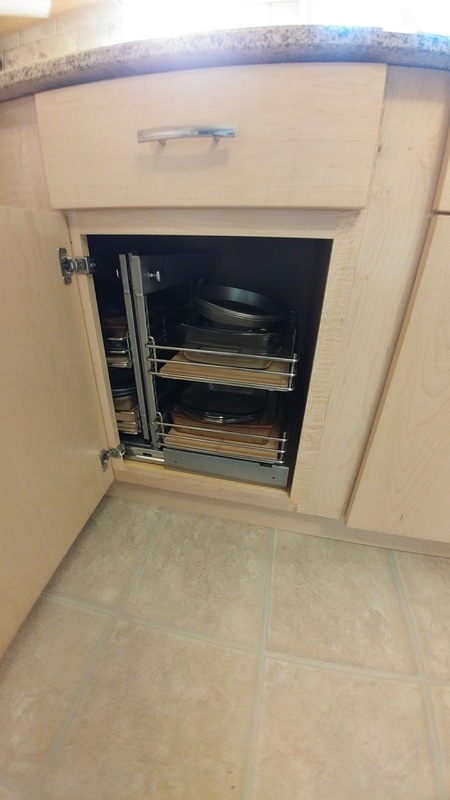 Those 2 shelves slide out for easy access. 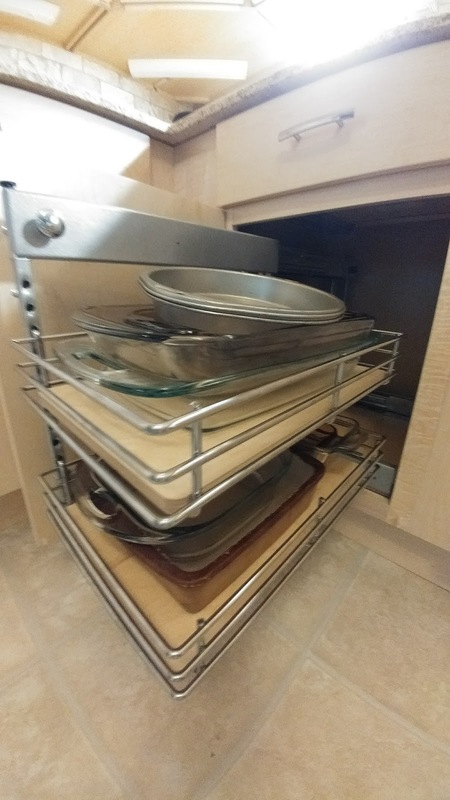 Double-decker partitions for different utensils. The top slides back to reveal the bottom. Cookie sheets, racks, and cutting boards are stored here. 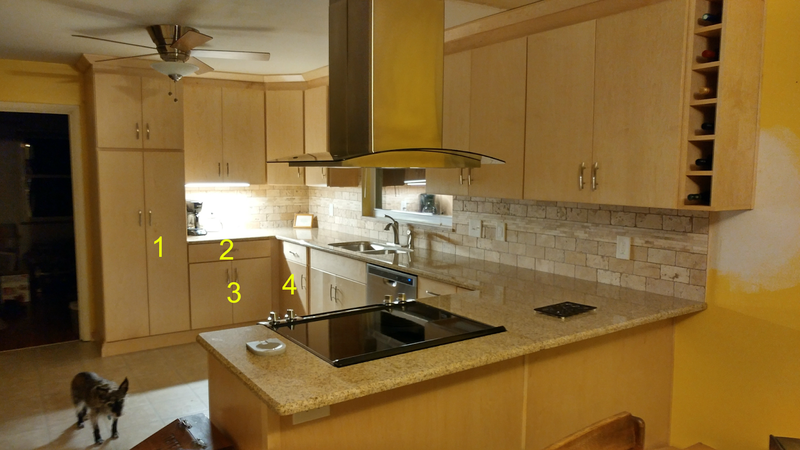 All of the doors have the soft close feature, except for the spice cabinet. 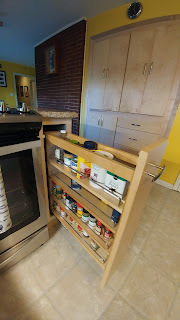 I like having my pantry redone (seen just behind the spice cabinet). I have plenty of space; in fact, I have a couple of cabinets with not a lot in them. Especially the lazy susan; I have very little in there because I just don't know what to put in there. I'm still trying to get used to having the oven under the stove instead of on the other side of the kitchen. And, I'm still trying to remember where I put some things! 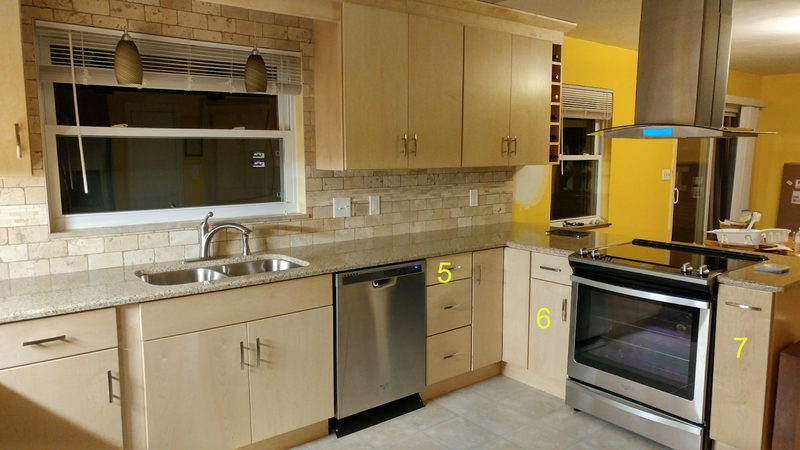 I really like the undercabinet lighting, although it is just a tad too bright. We haven't had a dimmer put on yet, so it's rare when I have all of the lights on at one time. I do love coming home and seeing my kitchen when I come up the stairs, especially when it's clean. As I said, I still have to have my ceiling and walls painted. 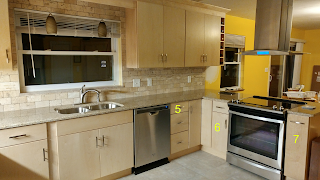 One of my sisters suggested painting the open area a sage green and the area where the cabinets are the same color as the grout. I just have to call the lady I want to do it, set it up, buy the paint, and let her get to work. Once that's done, there will be more pictures! So nice. 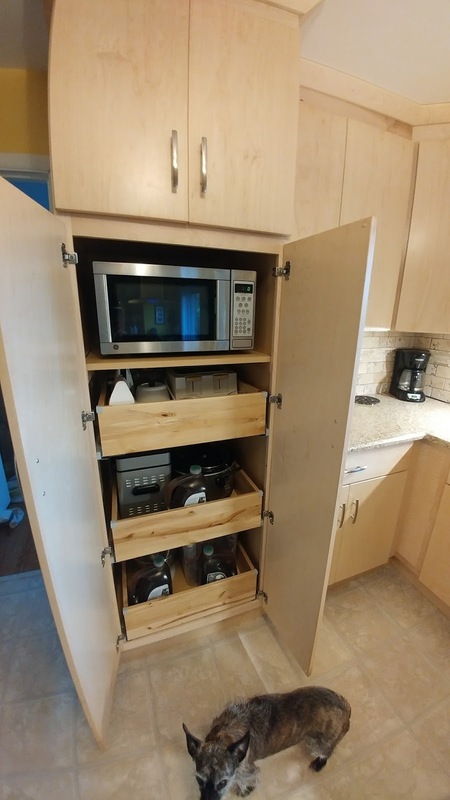 I would love to have some of those pull outs in my cabinets. I looks great and has some amazing storage! I'm so happy for you that the construction and all the problems you had are behind you! Enjoy! Your kitchen looks great! I'm glad that is behind you. 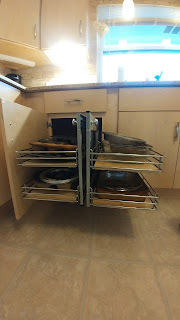 I told my daughter in law to put Easter, Christmas and Thanksgiving platters, bowls, etc in the corner lazy susan. It looks great! I have the corner cabinets that pull all the way out too and I absolutely love them. 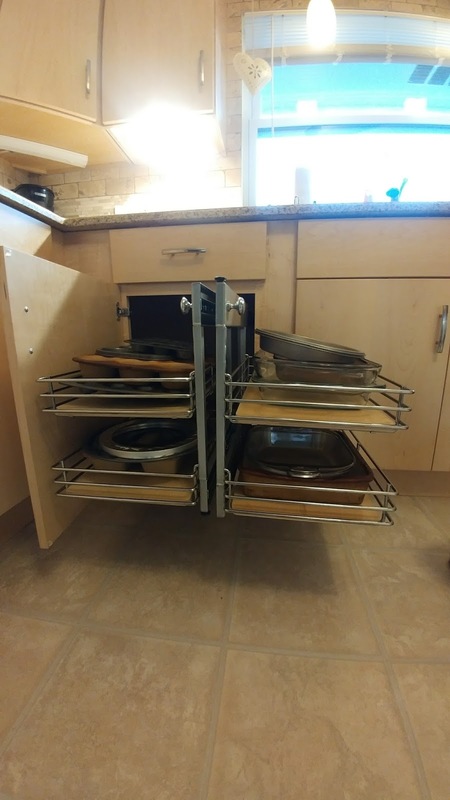 My last house had more of a true lazy susan style in the corner and things were always falling off the backside. Looks great!